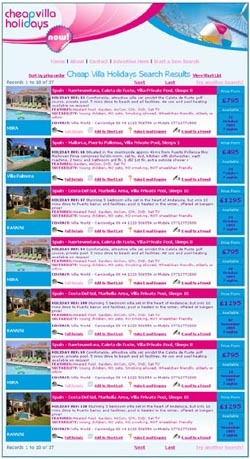 Important news for anyone searching for cheap villa holidays in Spain is the recent launch of a new innovative website. CheapVillaHolidaysNow is a one-stop site to off-load cheap unsold weeks and quickly shift early-booking villa holidays in Spain. The concept is simple and cost-effective but the focus is not only mainland Spain as the Balearic Islands are featured as well as Spain's Canary Islands, in fact most villa holiday resorts worldwide are featured. 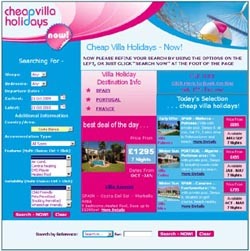 CheapVillaHolidaysNow is quick and simple to use and a real boon for Spanish villa owners and agents, tour operators etc. who feature holiday villas in Spain. Lengthy descriptions and photo galleries are not catered for nor required, instead visitors can search by all resorts in Spain and later even refine their search, if required, with their exact villa requirements. The search finally resolves to the advertisers own web page showing details of the villa and arrangements for booking directly. This is the most important aspect of all because it eliminates all of the tedious uploading normally required by villa holiday sites. Advertisers simply submit one image, brief details and contact information, then the villa is uploaded - for ever or until they decide to delete it! After that it is simply a question of adding the cheap offers, as they become available, and the price. In addition to all these obvious advantages CheapVillaHolidaysNow is ABSOLUTELY FREE until further notice. Villa owners, agents etc. can add as many villas, late-availability and early-booking holidays as they wish - and then just keep adding them, the adverts automatically expire on a daily basis! The site also provides a comprehensive guide to Spain's resorts and Costas. Another useful feature for visitors arranging cheap villa holidays is the car-hire search facility. This is a search facility for cheap car-hire for all of Spain's airports. There is also an article section, which be regularly updated, with travel features for the popular villa holiday areas in Spain.